When workaholics looking to retire in Mexico wonder aloud how they’ll avoid boredom, I don’t know what they’re talking about. Recently, out of curiosity, I checked my local events calendar here in Guanajuato. And just as I’d suspected, there were interesting activities for every single night of the week. And many nights offered more than one option. There was the free film series…a selection of short films by Mexico’s most promising young film directors, the series ran for five nights at a local auditorium. Hard on its heels came “Soul Train,” another free, five-day series, this time of edgy, U.S. urban dramas from the 1970s onward (New Jack City, anyone?). “Soul Train” was running at the same time as an international film series. The international films weren’t free…but general ticket prices were under $2 (and if you had a retiree card, available to expat residents over 60, tickets were just over a buck). Then there was the weekly symphony concert (ticket price about $3.50), various lecture series, and other concerts and films here and there. That’s not even counting volunteer activities that you can choose to take part in, from giving English classes to helping in animal shelters to organizing cultural events and working with local charities. Guanajuato is home to the acclaimed international arts festival, the Festival Cervantino, as well as several important historical sites. 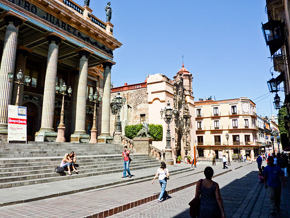 While Guanajuato is great, it’s far from being alone in offering so much to do. Go to San Miguel de Allende, for instance, just 90 minutes down the road, and you’ll find art galleries, theater performances, concert series, and more. Want to join a book club? You’ll find that, too. In Lake Chapala, a few hours away, its thousands of expats can choose from 80 or more activity groups to join. (And if your favorite hobby isn’t represented, just start a new group.) And that’s not even counting all the soccer and baseball teams all over Mexico whose games you can attend. You may not find a book club in your favorite Mexican beach destination, but then most beach types are busy doing other things: swimming, sailing, snorkeling, scuba diving, fishing… There’s no shortage of outdoor options on the coast. Even though I now live in the mountains, the beach bunny in me insists on some sand-and-surf time at least a few weeks each year. For snorkeling, swimming, and sheer beach indulgence, I find the Riviera Maya hard to beat (I usually hang out in Tulum). If I want some high-end, après-sun activities, as well (think boutique shopping or gourmet meals), I may head to Puerto Vallarta, where the beach is just the gilt on the lily. And since Mexico has nearly 6,000 miles of coast—much of it beach—I still have plenty of beaches to check out. It’s not a pretty job, but somebody has to do it. You're reading Having Fun is a Full-Time “Job” in Mexico by International Living, originally posted on InternationalLiving.com. If you've enjoyed this post, be sure to follow International Living on Twitter, Facebook, and Google+!